Its costs you when you do not know!! We are making CCTV monitoring using PC Security DVR and cameras affordable. For the simple peace of mind. Video Surveillance is affordable for everyone now. We have assembled a package to suit your budget. Protect your home or business with your own personal video surveillance system. We are your total ONSITE business and home solution. Upgrade any camera system to 700TVL. 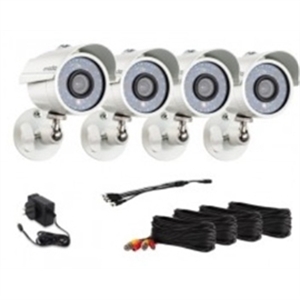 Camera kit includes four 700TVL high resolution night vision outdoor security cameras, four 60ft video power cables, and a power supply with splitter for all cameras. If you are looking for a reliable, high resolution bullet camera that’s suitable for your outdoor surveillance applications, this camera kit is a great choice. The cameras are equipped with 1/4" color CMOS image sensor and 3.6 mm wide angle lens to capture high quality images and deliver 700TV lines of high resolution video. This state-of-the-art 700TVL bullet camera is 100% weatherproof, making it perfect for both indoor and outdoor applications. With built-in 24 LEDs, these outdoor CCTV cameras deliver crystal clear video image in daylight, as well as black and white video in darkness up to 80ft away. It is perfect for indoor outdoor applications such as driveways, parking lots, halls, warehouses, and open office areas.